Frozen…the movie that literally every mom knows. In fact, I bet every mom knows every single word to the song “Let It Go.” Backwards. Maybe even in Chinese. I’ve gone as far as getting the sheet music and downloading background music to play it on my flute. The things we do for our children. 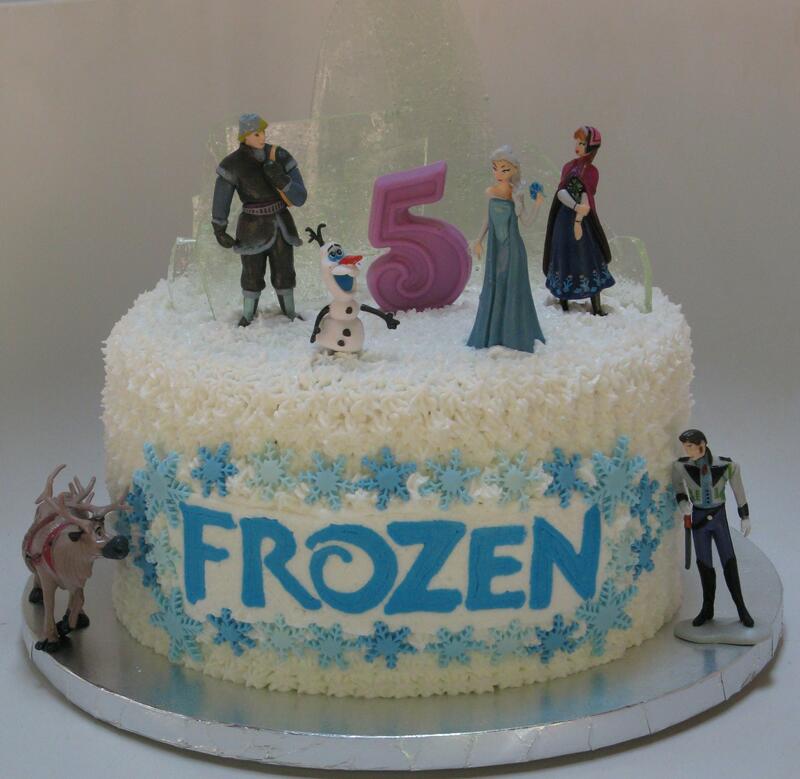 Our daughter turned 5, and she’s been talking about her Frozen birthday cake and party for the last several months, so I knew it had to be something good. 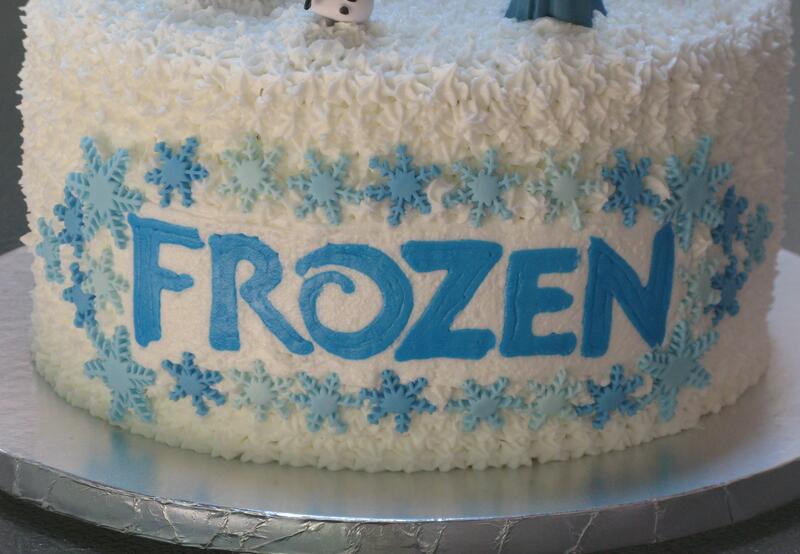 “Frozen” is a frozen buttercream transfer. The snowflakes are made out of fondant, a variety of different shades of blue and cut out with a snowflake cutter. I rolled out the fondant and cut the snowflakes out several days before putting the cake together so the snowflakes could harden. I watched this video to learn how to do a frozen buttercream transfer. The 5 is made out of chocolate using a chocolate mold. The “ice” is made out of hard candy (see recipe below), and the cake toppers were purchased from Amazon. In all honesty, you can use any figurines you please for placing items on a cake for decoration, just make sure they’re nice and clean before placing them on the cake. Nobody wants cooties. The cake was a 10 inch 4 layer white almond cake with buttercream icing…and I’ll have to say it was a big hit. There’s nothing like having a Frozen birthday pool party in August. In a medium sauce pan, combine sugar, corn syrup and water, cook on medium heat, stirring until sugar is dissolved. Turn heat to high, do not stir, and wait until mixture reaches between 300-310 degrees. Candy thermometer (digital thermometer is fine) is a must for this. When mixture reaches desired temperature, remove from heat and stir in flavoring and coloring. Spray a cookie sheet with butter spray, spread candy mixture out into a thin layer. Let set to cool and harden, break into shards and place on cake. You are so talented to be able to make a cake like this! It is beautiful. Your kids are very blessed. I tend to usually make cupcakes as cakes kind of intimidate me. Great job!